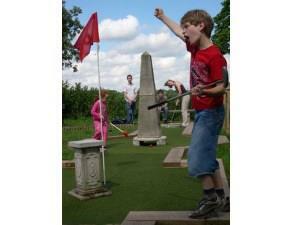 Wye Valley Miniature Golf01600 890360work Pitch & Putt/Crazy GolfPlay this twelve hole miniature course, set amongst the fantasy ruins of a picturesque Roman villa. Clubs and balls provided. Original design, excellent all-weather playing surface. Play this twelve hole miniature course, set amongst the fantasy ruins of a picturesque Roman villa. Clubs and balls provided. Original design, excellent all-weather playing surface. Special offer: half price rounds for customers of the Hedge Puzzle or Butterfly Zoo.